New rules are in place and local planning is underway! What is the Mississippi River critical area? How did it become a national park? Why are state rules necessary? What is the critical area? The Mississippi River Corridor Critical Area (MRCCA) is a joint state, regional and local program that provides coordinated planning and management for the 72-mile stretch of the Mississippi River through the seven-county metropolitan area and 54,000 acres of surrounding land across 30 local jurisdictions. MRCCA was designated a state critical area in 1976 to protect and preserve the unique natural, aesthetic, cultural and historical values as well as the biological and ecological functions of the Mississippi River and adjacent lands. (More precise details can be found in MN Statute 116G.15, Subdivision 1.) These resources and values are protected through development standards and criteria implemented via local land use plans and zoning ordinances. 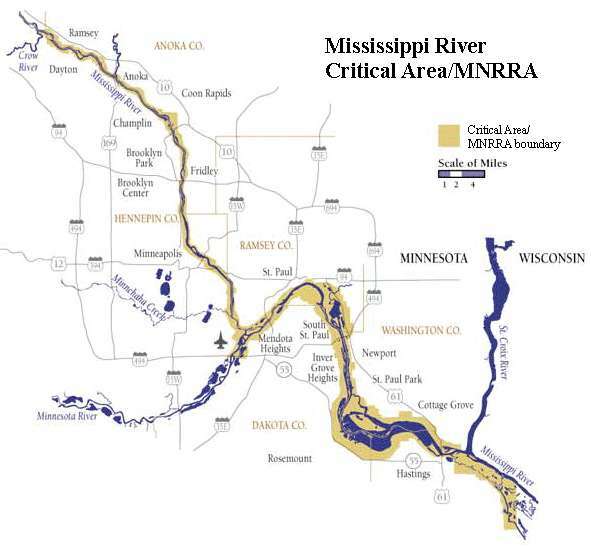 In 1988 the Mississippi National River and Recreation Area (MNRRA)—which shares the same geographic boundary as the MRCCA, was added to the National Park System to protect, preserve and enhance the Mississippi River and its fundamental resources. Adding the federal designation raised the Critical Area to a level of national importance. MNRRA operates as a "partnership park," with the National Park Service owning only 67 of the 54,000 acres within the park boundary. The rest is composed of city parks, regional parks, a state park, a national wildlife refuge, state scientific and natural areas, along with civic institutions, private businesses and homes.The National Park Service works in partnership with state and local government, bringing additional services and support to help local communities preserve, protect and enjoy the natural and cultural assets of the river corridor. Both the state critical area and national park designations were established to protect the Mississippi's unique resources of national and statewide significance. The largest river in North America is an international flyway for millions of migratory birds and a critical habitat corridor for fish and other wildlife. It also provides drinking water for millions of Americans. With the river's only waterfall and gorge, the Mississippi changes more through the Twin Cities than anywhere else in its entire length, transforming from a prairie river to a gorge to a floodplain river. This National Park is where the river grows up into the famed Mightly Mississippi that is known around the world. In addition to state and federal government involvement, more than 30 local jurisdictions make up the MRCCA and MNRRA corridor. After 30 years, the original MRCCA regulations had become outdated and needed to be replaced by common sense state rules that could be applied consistently and effectively across 25 cities and five counties. While most national parks have federal regulations that apply everywhere within the park, a special bargain or compact was formed to allow federal, state and local governments to cooperatively manage this national park through the state critical area program. The state of Minnesota held up their end of that bargain when they finalized strong state rules for the critical area and national park in 2016. It took more than a decade to complete, but Minnesota now has official state rules in place to protect the outstanding natural, scenic, cultural and recreational resources of the Mississippi River Corridor Critical Area (MRCCA). The new rules, formally adopted at the end of 2016, represent a major milestone for our National Park on the Mississippi River. During the next few years, each of the 25 cities and townships along the river corridor will have to update their local plans and ordinances to be consistent with the new rules. The first step is to update river corridor planning documents and maps, and incorporate them into the cities’ comprehensive plans. The official deadline to complete these plans is December 31, 2018, but some cities could request that their deadline be extended. New requirements for the critical area plans will give each community an opportunity to inventory the river resources and places they value, and establish goals to protect those resources. Local residents can get involved and help their city planners by identifying important scenic views, suggesting future river access points, and encouraging sensitive lands to be set aside for habitat and water quality benefits. To learn more about how you can get involved and weigh in on your local plan, visit FMR’s online resource page How to get involved in Mississippi River Planning. Sign up to become a River Protector and be sure to click "I will advocate for the vitality of the Twin Cities river corridor, our national park," and we'll make sure you receive future MRCCA communications from FMR.